Yesterday I posted about British Airways’ website finally displaying Qatar Airways award space, which is a pretty exciting development. As it stands, Qatar Airways is set to join the OneWorld alliance on October 30, 2013, though both American and British Airways already have reciprocal mileage agreements with Qatar Airways, so it’s possible to redeem both mileage currencies for travel on Qatar Airways. Going back a couple of years Qatar Airways partnered with United, so it was possible to search their award space on united.com. At the time award availability was ridiculously good. Virtually all flights seemed to have multiple business class award seats, so it was a great use of United miles. I was curious to see if availability has changed over the past couple of years. So the bad news is that award space on Qatar Airways doesn’t seem to be as readily available as it was a couple of years back. It’s by no means horrible, but just not great either. 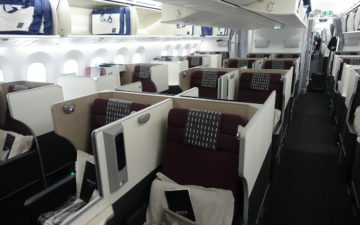 The good news is that when they do release business class award space, it seems to be three to four seats per flight. Qatar Airways’ North American destinations include Chicago, Houston, Montreal, New York, and Washington, and based on the searches I’ve done it seems like Chicago and Washington are the easier gateways for award availability, while Houston, Montreal, and New York are the more difficult gateways. 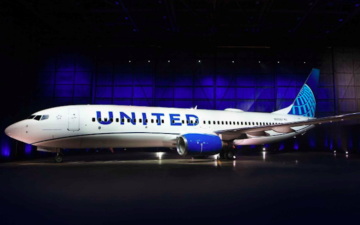 Starting April 2, 2014, they’ll also be launching service to Philadelphia. Generally availability seems to be best on Tuesdays, Wednesdays, and Thursdays, with very little space on weekends aside from within a week of departure. Qatar Airways only has a first class cabin on select routes, including most of their flights to Paris and some of their flights to London. The good news is that award availability from Paris is phenomenal. 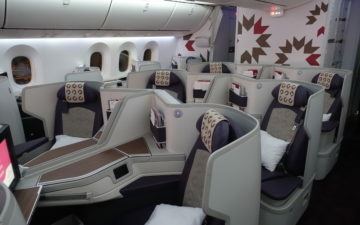 With the exception of travel over peak summer dates next year, they seem to be releasing two first class award seats and four business class award seats per flight. Availability out of London is good. Not amazing, but good. Unlike Paris not all flights seem to have two first class and four business class award seats per flight, but nonetheless a good number of flights have award space. There’s not much availability over weekends, but with a bit of flexibility it doesn’t seem too tough to find space out of London. If you’re redeeming American AAdvantage miles for travel on Qatar Airways there should be no fuel surcharges, though the same isn’t true if redeeming British Airways Avios. Nonetheless Avios can be pretty attractive for short-haul travel since they have a distance based award chart. So just to give a few examples of what the fuel surcharges are like, I figured I’d look at a few different markets to compare. 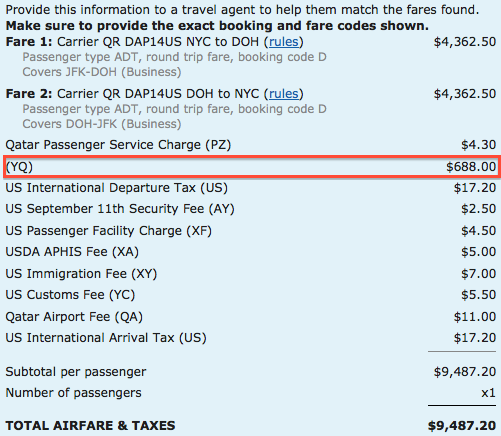 The fuel surcharges below are for roundtrip business class tickets. A one way business class ticket would incur half the fuel surcharges, and coach fuel surcharges seem to be roughly a third cheaper than business class fuel surcharges. 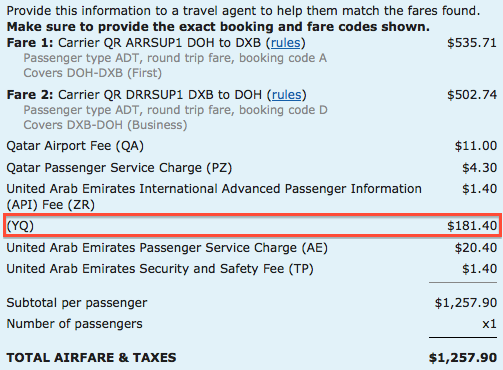 Between Doha and Dubai the fuel surcharges are $181.40, which actually seems rather high for such a short flight. Meanwhile between Doha and Johannesburg they’re $269.20. Between Doha and Tokyo they’re $329.60. And between Paris and Doha they’re $351.60. Lastly, between New York and Doha they’re $688. So on the whole these fuel surcharges aren’t cheap. They’re not quite as bad as those imposed by European carriers, but also worse than those imposed by Cathay Pacific, for example. Still, in many cases it can make sense to redeem British Airways Avios for travel on Qatar Airways. The British Airways search tool can be cumbersome to use, so hopefully this is helpful as a general overview. There are lots of great redemption opportunities for travel on Qatar Airways, though the best will come once they join OneWorld on October 30 so you can finally redeem distance based awards through AAdvantage for travel on them. what about MUC-DOH in F? and how are we supposed to get to MUC in F on oneworld? Ben, you missed the news – QR has announced that they will remove YQ/YR and incorporate it into base fare soon! What about PHL? I thought they will have flights to Philadelphia starting in Q1/Q2 of 2014, just another N.A. location that is close to NYC and Washington to consider. @ ucipass — Availability generally seems to be horrible between mid June and September, but other than that I see plenty of space to the Maldives. @ Phil — Yeah, I think as of now a lot of space is only searchable and not actually bookable via the British Airways website. But space should be accurate, even if it can’t be booked yet. @ Lantean — As far as I can tell service to Munich is operated exclusively by 787s, so there’s no first class cabin. @ PedroNY — Whoops, great point. They seem to have four business class award seats just about every Tuesday and Wednesday once the service starts next April. Just updated the post to reflect that. aha… I thought in the previous post you confirmed they have F to MUC… I guess i was confused. @ Lantean — In the past they had first class to Munich, though they recently put the 787 on the route. London and Paris are the only destinations I know of that have first class. That being said their first class really isn’t that great, and their business class will be more valuable for distance based AAdvantage redemptions anyway, so I don’t think it’s a huge loss. Hey Lucky – Do you think that BA or AA will add QA middle east destinations to their system after QA join date. Like I wanna go to Iraq and QA flies their to Northern Iraq: BGW, EBL, ISU; also Southern Iraq: NJF and BSR. I wanna go say NJF-DOH-ORD-DTW on one award. It looks like its not in their systems. Also I know AA charges 67.5k for one way, How much BA charges for one way?. Thanks in advance. @ AKCredit — Sorry, not sure I follow — what do you mean they haven’t added those destinations to their systems? You should have no issue booking those destinations by calling American or British Airways. As far as how much British Airways charges, they charge on a per segment basis, so the cost is entirely dependent on the number of miles flown. Thank you for clearing that up for me. Sorry I went and done it online and it was in their system.Thank You. thank you. how would you compare their first and biz? 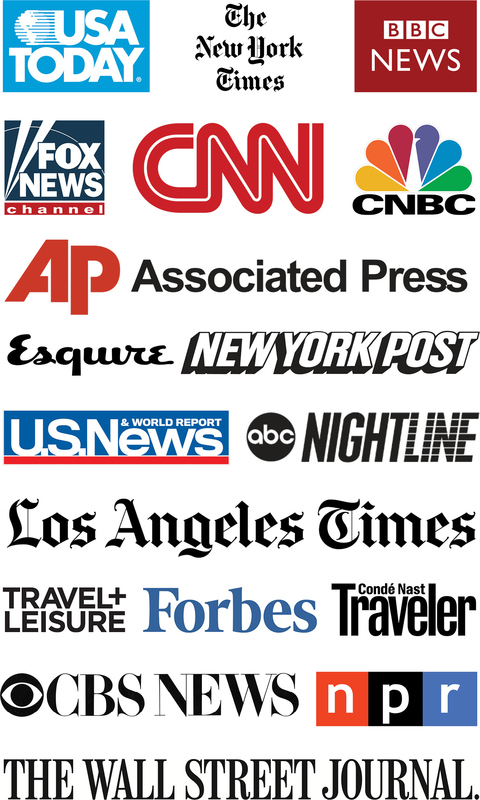 if F is not much to talk about… is the biz really bad? It’s fine, but the hard product isn’t revolutionary and service wasn’t great either. I think it’s more that they have a very good business class with fully flat beds, turndown service, and pajamas, so by comparison the first class isn’t that much better. OK, thanks Ben, I guess biz is Ok then. 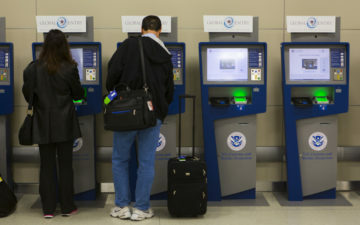 when are you flying EWR-SIN? seems like that flight is ending soon. @Lantean and don’t forget you get the Premium Terminal in Doha with massage, full sushi bar, a la carte menu, etc. And 18 new lounges when the new Hamad Airport opens. BA site will show Qatar availability but it doesn’t recognize SEZ or Mahe or Seychelles as a valid destination or origin – anyone aware of a workaround for that? I just finished booking DOH-CDG-DOH using your advice. I called AA and the ticket came for 60K miles + 160 USD in taxes and fees. Now, 60K is for business class right? I mentioned the agent and she called QR, the agent there said that the booking will be honored. That means there is a glitch in the system that books First Class tickets with Business class miles. Amazing thanks @lucky for your advice. @ Antonio C. — Congrats! Is your ticket booked in the “U” or “Z” booking class? It was confirmed (today) at Z class. It took 2 days to confirm, and in the end they charged me the 80K; I can see it now on my account that they deducted the 60K, reinstated back and deducted the proper 80K. Is still a great deal. The airfare is some 6,500$. @ Antonio C. — Stuff rarely “slips” through ticketing. Happy you got it confirmed in the end even if it’s at the first class mileage cost. I know this is an older thread, but Qatar now has a new route to DFW since the original posting. I’m in the planning stages of an anniversary trip with my wife to the Maldives (MLE), and I’m curious about the general business class AAdvantage award availability on Qatar DFW-DOH-MLE. Qatar-only flights don’t show up in the AAdvantge online awards charts, and I believe the only way to confirm is by calling AA. I’m hoping you may have some knowledge of these awards. If it matters, it would likely be in April, May, or June. 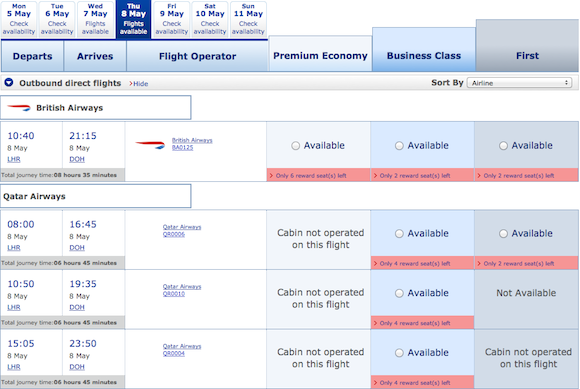 @Lucky – I must be doing something wrong, because when I search BA, the only flights that show up are BA flights. I feel like I’ve followed the guidelines from the link you posted. I know the flight exists because I’ve been able to locate it on the Qatar website. I even tried searching a single leg of the flight (DFW-DOH) as you suggested, and no luck. What am I missing? Thanks! Are you aware of QR blocking space to the US during the holidays? It seems like there’s no award space at all between like ~20 Dec – 10 Jan in both directions… just want to make sure I’m not missing something. @ acs — It could be that they’re still releasing space for those dates, so I’d hold off a bit longer before drawing any conclusions. Any clue if QR ever releases more than 4 business class award seats per flight? Is QR like some airlines that only releases award seats in batches at a time? So, if you put a hold on four business class QR awards, up to four more seats might be released shortly thereafter? Do they release more awards closer to departure? Or are the 4 seats that are (optimistically, on some routes) made available when the booking window opens the only 4 business class seats that will be released for that flight? I guess according to the link below, when the DFW-DOH flight was newly added, up to 8 business class seats could be available on that flight close to departure date. So, to add more data to my previous question, it looks like business seats are not limited to being released in batches of four, at least not system-wide. I wonder if this was an isolated incident, or if other routes currently have availability for more than four business class seats on a given flight. @ tyo_flyer — They do often release more seats close to departure, and sometimes you do see more than four seats, though it’s at least somewhat rare. Thanks, Ben. I guess I’ll keep my eyes peeled for such cases. how can i use Qatar airline to travel from Amman Jordan to Johannesburg , i am a Royal Jordanian Frequent flyer ?